The perfect way to the day of the Unity Christian Music Festival – 2019 is the 13th year of the Unity Choir. 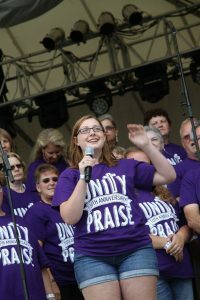 Unity Praise will again be on the Main Stage presented by Country Dairy as the opener on August 8, 9 and 10. Plan to get to the main stage area early, and unite with the body of Christ – giving glory to God through worship. The Unity Choir was formed in 2007, to open the festival with worship and to give action to the “Unity” name, by bringing together worshipers from different denominations, races and ages. 60 voices, plus director and band. Choir is made up of worshipers throughout the region, representing more than 25 different churches. Members are worship leaders, praise team members, Sunday School teachers, and lovers of Jesus! The youngest is 15 and the oldest is 85!